Fans are so excited to learn about this new movie, because aside from the fact that it has great celebrities, it is base on controversial true to life story. This movie is called “Boy Erased”. It is story of a young man who admitted that he is gay. After his father found out everything about him, he was then sent to a program that specialized in curing homosexuality from men. The movie is great with the appearance of Oscar Winner Russell Crowe and Nicole Kidman along with the Oscar nominee Lucas Hedges who plays the role of this young man whose father is a pastor of a local Baptist church. This movie is very sensitive knowing that there are many states and people all over the planet who are having debate with regards on how to view homosexual from personal to religious view. 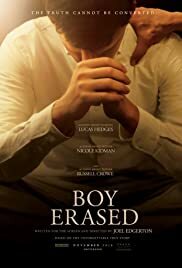 On the other hand, this will gives us great entertainment on how the young gay (Lucas Hedges) cope his struggle as a son of a Baptist preacher. His family and friends have different views about the status of the young boy. While Nicole Kidman (the mother) regardless of what her son is struggling, she is always there for him. Furthermore, his father still is trying to educate him to live normally as a man and to view that God will not be pleased if he would follow his homosexual feelings. The movie is very promising because this involves the lives of people and their struggles in real life.